Several hundred people rallied in Houston, ready to battle and defend the Sam Houston monument. Turns out, they got hoaxed. After weeks of planning, several hundred people from across Texas and from other Southern states converged in Houston on Saturday, prepped for battle and with a serious mission: Protect the Sam Houston Monument at all costs. 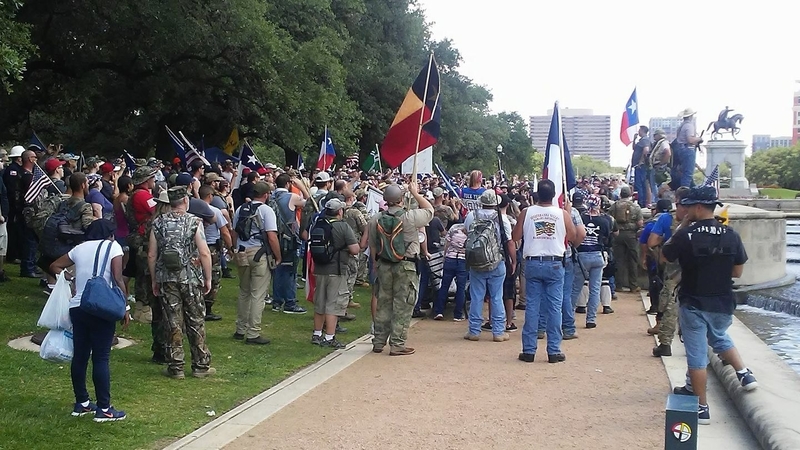 They swarmed Hermann Park early in the morning, decked in camo, leather vests, Infowars jackets, and Texas pride shirts, toting American, Texan, and "Don't Tread on Me" flags, "Stand With Sam" signs, and semi-automatic rifles and snipers. A 40-person-deep security team patrolled the area, while the hydration team passed out water, waiting in the Texas summer heat for enemy leftist groups to arrive. "We set up four-man teams in different sectors making sure the anti-fascists wouldn't infiltrate us or pick off one or two people by the bathrooms," Jeremy Alcede, head of security for the group This Is Texas, told BuzzFeed News. "We were told hundreds of [anti-fascists] were coming." The enemy never arrived — nor had they ever planned to. Turns out that Sam Houston, a beloved state hero who served as the first president of the Republic of Texas after it seceded from Mexico, was never in trouble. There hasn’t been any organized effort to remove the giant statue, which has stood erect in the park since 1925. Hearing of the drama, Houston’s mayor emphatically stated that the monument was not being considered for removal. And unlike other cities working to remove Confederate monuments, like New Orleans, Houston never actually joined the Confederacy. But fueled by a May 19 Facebook post from a group called Texas Antifa, rumors swirled that leftist groups wanted the Sam Houston Monument to be next, sparking an intensive "Don't Mess With Texas" campaign. "We're about to have a huge event in Houston June 10 with the combined forces of several large groups, perhaps our biggest ever. The Fascists better not show up or they will be limping home bruised, broken, hurt, and crying with their tails tucked between their legs," the group said, including maps of the park and directions. "We will be freely heard without their attendance because they rarely counter against us since they don't have the support numbers and are few and far between, especially in Houston. Brothers go to our National Page for the event information." However, Texas Antifa is not a real group. It claimed to represent the anti-fascist movement, part of a growing trend of fake Antifa accounts that are trolling people and spreading false information. 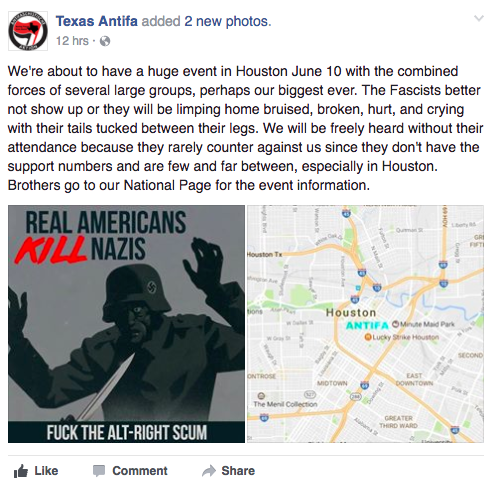 Shortly after the post, the Houston Chronicle and local NBC affiliate KPRC-TV published stories citing the group and detailing its efforts to rally in favor of eradicating the monument, despite the legitimate local anti-fascist group, Houston Antifa, flagging the group as an impostor and warning its members to steer clear of the rally. "Trolls are going to continue to use these nefarious tactics in attempts to misrepresent the purposes and ideologies of Antifa, to use hot button issues like statue removal, etc to mobilize and drum up ire from generica MAGAs / Conservatives," Houston Antifa told BuzzFeed News on Monday. And while the group called Houston a "racist and slave owner that had a questionable history," it emphasized that "statue removal is not a current campaign that the Houston community is rallying around." Unfortunately, the news that the anti-fascist group and its planned rally was all a hoax never reached Alcede and his ballooning army of nearly 4,000 This Is Texas Facebook group members. Further incensed by Quanell X, the leader of the New Black Panther Party in Houston, citing and praising the fake Antifa's cry for removing the statue on a Fox News segment, the contingent of patriots mobilized and planned the rally days after the impostor Antifa account announced its rally. "Their goal is to remove the Sam Houston statue. Many of these communist punks are embolden after they lay claim to a win in New Orleans by bringing down the Confederate monuments," This Is Texas wrote on May 22. "We invite all III%ers, Oath Keepers, Militias, Tea Partiers, Liberty Loving Texans, Liberty Loving Americans, Open Carry Organizations, and anyone who loves Texas & wants to protect our sovereign soil & history to join us." Kyle Chapman — who became a renowned alt-right leader after violently beating a person in Berkeley — also cited the fake Antifa's mission and flew to Texas to fight against them, writing, in all caps, "ANTIFA, YOU’RE ABOUT TO GET THE MESSAGE EVERYONE ELSE IN AMERICA KNOWS BY HEART: DON’T MESS WITH TEXAS!" So they gathered, after weeks of meticulously preparing and spending thousands of dollars on supplies, shouting rallying cries of Texas pride and condemning the "snowflakes and libtards" who threatened their heroes. Hours later, the group, and the hundreds of Houston police who were patrolling the park because of the rally, disbanded without having to fight anyone. "In reality, we were duped," Alcede and one of the founders of This Is Texas, Brandon Burkhart, said Sunday night. Exhausted, Alcede and Burkhart went live on Facebook Sunday night to relay the hoax to their members. No one really seemed to care. 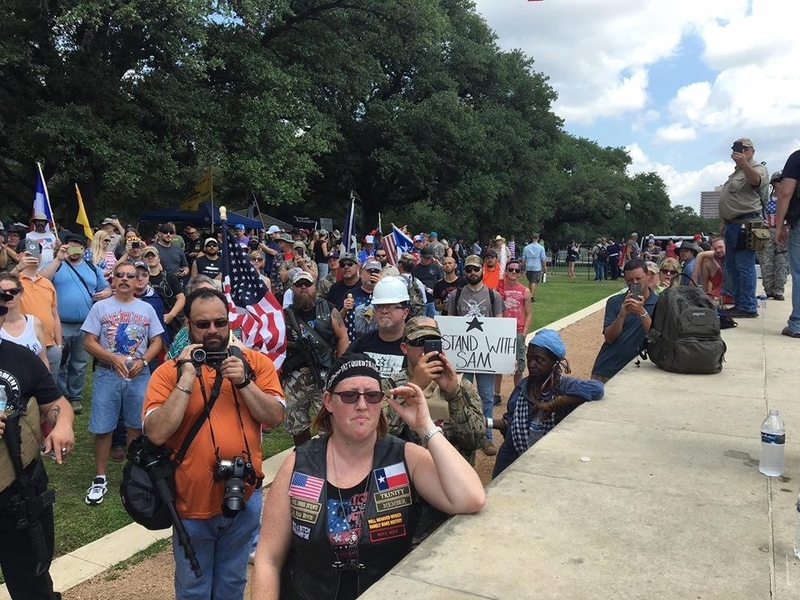 In comments, people enthusiastically praised the efforts and called for a "This Is Texas militia" to travel to all future events to further drive home the message that "no one messes with Texas." "We are working on this," Alcede replied. "We now have an organization we can copy and paste and we can mobilize at a moment's notice all over the state to protect our flag." Several attendees reported seeing "Antifa" members in the bathroom, "but they must have run off because they saw our crowd size," Alcede chuckled to BuzzFeed News. "I still believe the threat was credible and we deterred them." 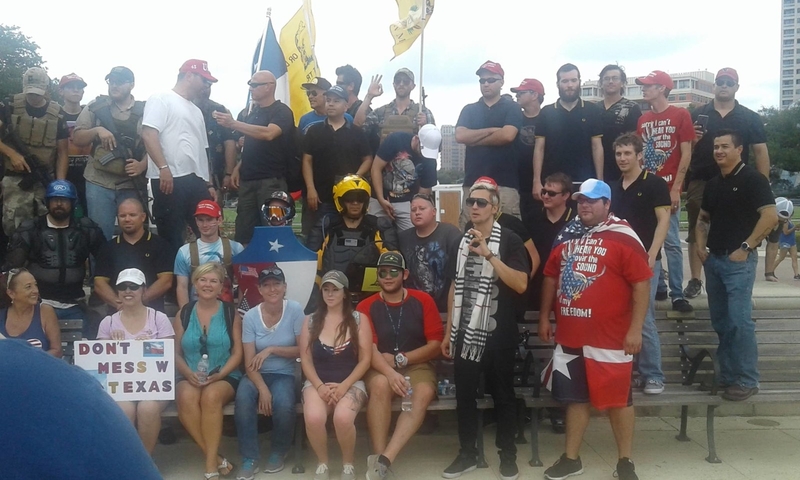 Houston Antifa emphasized that their members knew the rally was a hoax and did not attend, though it was possible some of the statue defenders had seen some demonstrators on their way to protest a nearby anti-Sharia event. 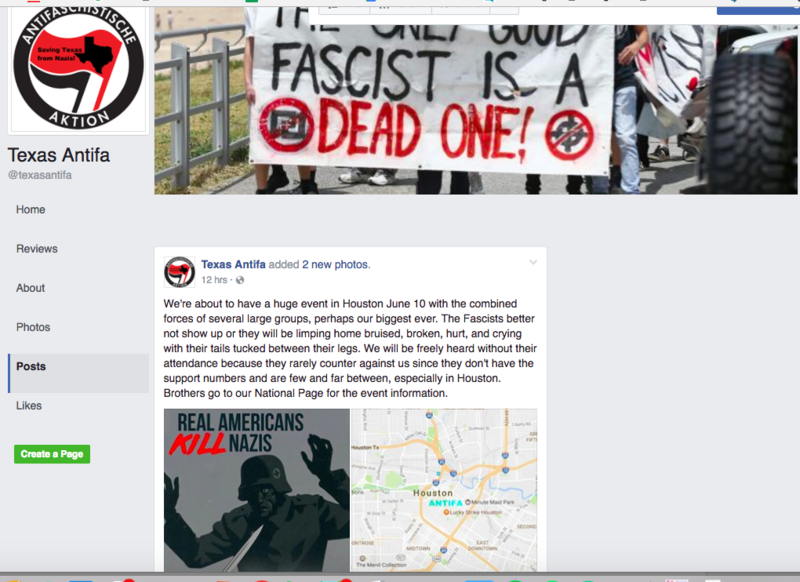 In another twist, a group claiming to be part of the hacking organization Anonymous claimed responsibility for the fake Antifa site as a way to rile up Texan conservatives to form a resistance and defend Sam Houston. “It was always an Anonymous event to drive support and attention to an expired Texas law that protected its historical monuments,” the group said in a video posted to the Texas Antifa YouTube channel on June 7. Regardless, Alcede said that spirits are still high and his band of patriots "accomplished their mission," despite them being tricked. "We were there to let people know that this is our history and we're now going to make this group official. We're trademarking the logo and going to continue fighting," Alcede said on Monday. "It's the patriots against the snowflakes. That's what this is about."